Exquisite tradition of our land. With the discovery of the New World, the conquistadors were seduced by the fascinating taste of smoking cigars. The Dominican Republic hand crafts a premium cigar of international quality not easily acquired by cigar connoisseurs in the United States. 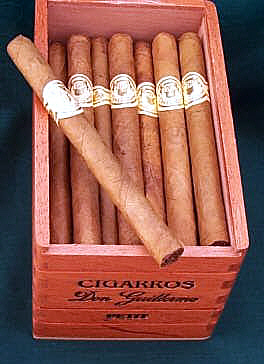 Cigarros "Don Guillermo" continues the tradition to satisfy the demanding pleasure of cigar aficionados. 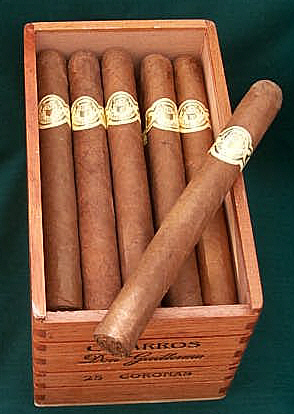 Ricardo's is pleased to make these premium cigars more accessible by offering them here. 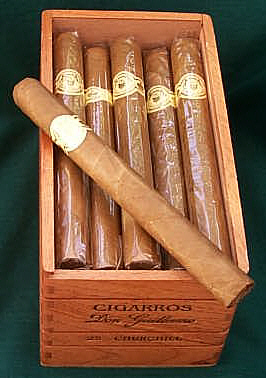 The Don Guillermo cigar is a combination of four types of selected tobacco leaves. These leaves are hand crafted by expert artisans to impart their aroma and exceptional flavor which is characteristic of all Don Guillermo cigars. 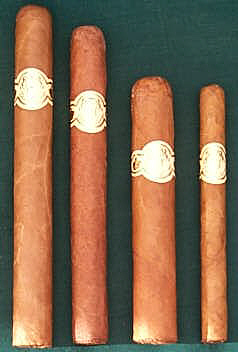 Cigarros Don Guillermo is a product of unique quality. A cigar that allows us to share a tradition, and with it, part of our land. Don Guillermo Cigars use the most select Dominican leaves for their filler and binder. This tobacco is grown at the best Dominican tobacco plantations. The USA grown Connecticut wrapper adds the finishing touch of class to this great smoking premium cigar. Rarely found at local shops, these handmade, flavorful, long-filler cigars are smooth and mild. All have a sweet tip! "Calidad Premium"
The Don Guillermo Special Reserve Supreme No. 1 is a powerful figurado that is full bodied, with sweet flavors that linger on the palate. Each Special Reserve Supreme No 1 cigar passes through four inspections and the tobacco is aged more than 5 years. The Supreme cigar is completely hand rolled by a master roller and will burn a perfect ash in its own contour. You will find in each Supreme cigar an extremely smooth and exquisite smoke. Note: Please call 484-722-8259 or email us before ordering any of the Don Guillermo cigars which appear below. The Don Guillermo Special Reserve is a beautiful cigar with a dark, reddish brown wrapper. The Special Reserve draws well with creamy, toasty notes on the palate. Each Special Reserve cigar is encased in a glass tube to protect freshness and preserve flavor. The Don Guillermo Compa Robusto is a great smoke. Beautifully constructed in the Guillermo tradition with a perfect Connecticut Shade wrapper. A defined taste to satisfy the highest standards with an exceptional aroma. The Don Guillermo Piramide is the perfect cigar for a long and pleasant smoke. A Connecticut Shade wrapper envelops the traditional Don Guillermo selected tobacco leaves creating a cigar that will please the most discerning smoker. Sealed in cellophane for protection. Flavored cigars, flavored cigars humidors, flavored cigars samplers, gifts, and premium flavored cigars accessories. Select Cigars by Flavor Here Amaretto Anisette Anise Apple Blackberry Bourbon Butterscotch Cherry Cherry-Vanilla Chocolate Chocolate-Macadamia Nut Cinnamon Coconut Coconut-Macadamia Nut Cognac Coffee Kona Coffee-Macadamia Nut Fruit Flavors Grape Honey Honey-Nut Honey-Vanilla Irish Cream Mango Mango-Macadamia Nut Maple Mint Mixed Drink Nut Flavors Orange Peach Pina Colada Raspberry Rum Sambuca Spices and Herbs Strawberry Sweet Vanilla Vanilla-Coconut Vanilla-Honey Select Single Sticks by Your Favorite Flavor Here... 60+ FLAVORS! GO TO CIGAR ACCESSORIES - Cigar related items: humidifiers, cigar jars, cutters, and other specialty items. A Special Section of our Shop Featuring Highly Rated Non-Flavored Premium Cigars. Glad you stopped in and Welcome to Ricardo’s Cigar Shop! Your one stop Flavored Cigar Shop. Here you will find many varieties of Premium Flavored Cigars. Succulent, Aromatic, Tasty, Luxurious, Sensuous, Flavorful. A few words to describe these wonderful Cigars. Various sizes and shapes to satisfy your preference.